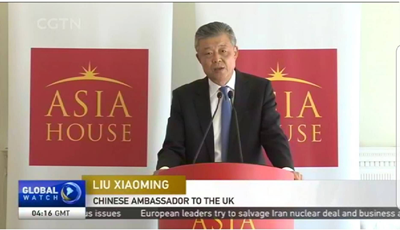 Presenter: In a speech in London on Monday, the Chinese Ambassador to the UK indicated that the latest consultation between China and the United States demonstrates the responsibility of the major stakeholders. CGTN's Wang Xuan reports. Liu Xiaoming: For China, this outcome is in the interest of achieving high-quality development to meet the growing consumption needs of the Chinese people. For the US, this outcome will help cut trade deficit and support growth and employment. This outcome is conducive to global economic and trade stability and prosperity. 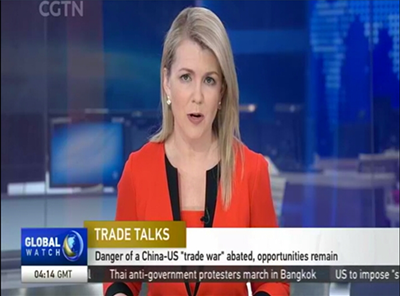 Reporter: The China-US trade relationship and the direction it is heading will have a far-reaching impact on the development and stability of China, the US and the rest of the world. 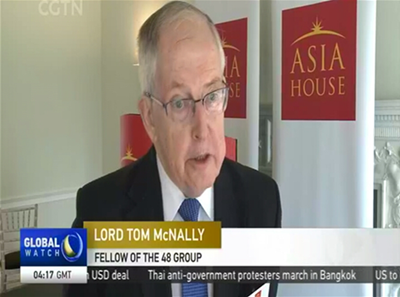 Lord McNally: I think what is encouraging from the weekend's news is that both have stepped back from the brink of a trade war. And it does give both sides and the rest of us a chance to think constructively about the way ahead. 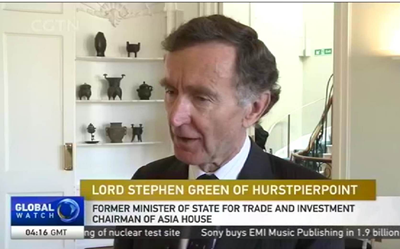 Lord Green of Hurstpierpoint: The US and China are the two largest economies in the world, the two largest trading partners in the world. Therefore it matters to us all to direct a good relationship in the international sphere, so that everybody could engage successfully in the investment and trade. So it's important, it's a win-win result from the weekend. As the ambassador said there's some way to go in the detail, but we have started off in a very good direction. Liu Xiaoming: If China is a fast train to development and prosperity, then everyone is welcome on board and take a share of the benefit. One important event is coming. It's the first China International Import Expo to be held in Shanghai in November. We welcome all businesses to participate, to showcase their products and services. Here, being a Chinese Ambassador in the UK, I encourage British businesses to participate in this International Expo, this is the very first such event. We are doing nothing, just importing from the world, not exporting. Reporter: Those in attendance here said the Expo offers compelling testimony of China's determination to open its market wider. Lord McNally: It's the first time I've heard about it. I certainly want to go along to the promotion, what the Ambassador said today, that would come later this year. As he said, I think, that offers a real opportunity for British and European companies to go to China and to set up their stalls and make a real effort of exporting.